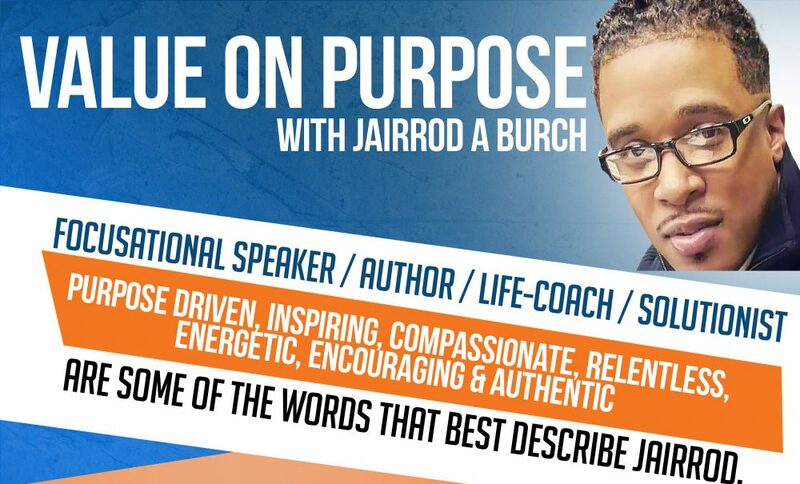 “Jairrod A Burch is one of the most impactful voices of inspiration emerging in our world. His passion and desire is to awake and help define the true power we possess when we discover how valuable we are within“. Jairrod is relentless in the quest to push, pull, and propel this generation into their greater purpose by teaching them the explosive enlightenment one experiences when one realizes how much they are worth. He is also the Founder of “Academy Victorious”. A University within Value on Purpose which teaches, empowers and equips schools, corporations, sports teams, organizations, and other diverse professions on the power of knowing your purpose when you discover personal value. Jairrod also served as partner and spokesperson for (BIGMANTAKEOVER), which is endorsed by pro (NFL Hall of Famer, Michael Strahan), and founded by former (NFL player Dwight Johnson). An organization designed and dedicated to empower student-athletes to do more than just endeavor to enter into the (NFL) National Football League. This organization strives to produce excellent young men who strive to be productive in every area of life. Now also a newly approved professional speaker & entrepreneur with the ( YBA) – better known as the (Youth Business: ALLIANCE). Jairrod is apart of a team that is led by private sector instructors and business leaders who impact high schools throughout the Los Angeles, CA area. Jairrod is a very on point and sound speaker. His life experiences along with his passion for impacting others allows him to inspire anyone from any Walk of Life. It is a pleasure and honor to speak to the incredible power that resides within Jairrod Burch, Sr. This dynamic speaker is not only relevant but knows how to captivate audiences of all sizes and demographics. Check out my NEW BLOG, The VALUE in ME!